I am absolutely thrilled! The changes were all fairly minor, but the overall effect is major. A small image in the spine that might just catch people’s attention. Compare that to the original full cover – we only supplied the front image for that one. I supplied the copy for the spine and back blurb, but it was added automatically, and with no custom design. I’ll need to proof a new copy of the paperback, so it will be a few weeks before the second edition is available to buy. I can’t wait. I think the difference is astonishing, and it looks a lot more professional. I’d love to hear your thoughts. Do you like the new cover? Would you be more likely to buy it? Following a recent reassessment of Darklands’ cover, my designer has come up with a new wraparound cover which I am HUGELY excited about! The changes are kind of minor, but the effect is major. 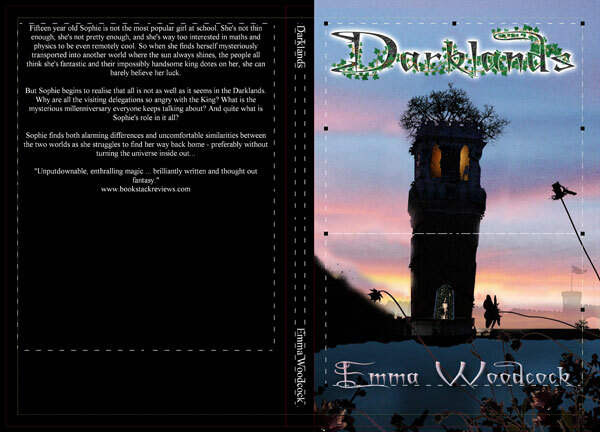 You can see Darklands’ new cover here. Kikimora is still a way from finished (yes, I know, I foolishly said, ‘coming summer 2012’ in the blurb at the back of Darklands!) I’m mid second draft, doing a fair bit of reshuffling and writing a few new scenes. But I’m already thinking about the cover design as well. Kikimora takes place in winter in a mountainous, forested land. I’ve had a pretty strong idea of what the cover should be for a long time: I want it icy blue and white, I want trees. And for contrast I want the title in dark pink or red. There could also perhaps be a ghostly figure amongst the trees. The minute I thought of these things I pictured two album covers which each in their way come pretty near the mark. 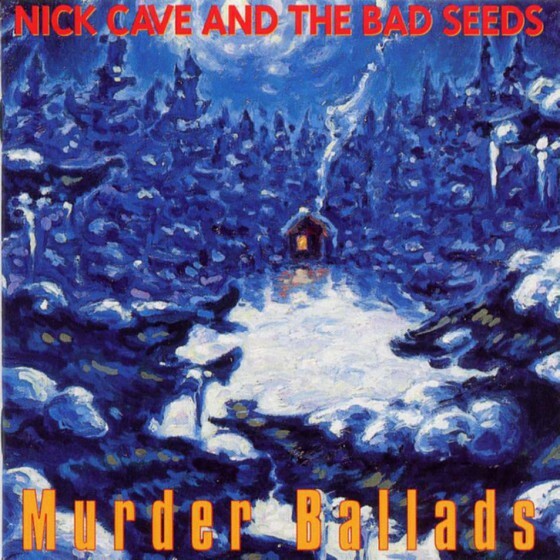 The first is the 1996 album, Murder Ballads by Nick Cave and the Bad Seeds. 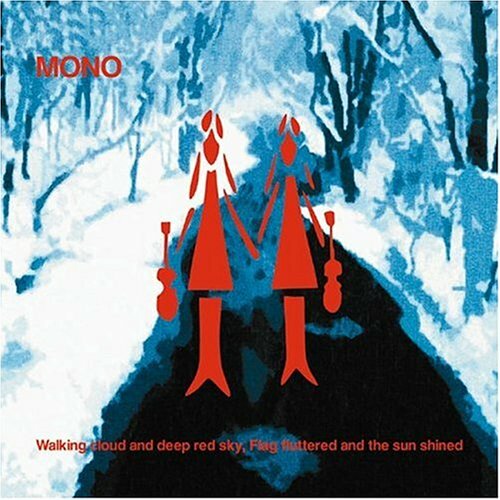 The second is the slightly more obscure 2004 album by Mono, Walking Cloud and Deep Red Sky, Flag Fluttered and Sun Shined. It’s not just that each of these images ticks the boxes outlined above; I also love the mood of mystery and unease which they evoke: the dark and lowering trees, the sense of isolation and wilderness; the dramatic effect of small flashes of red against a fairly uniform blue-white. Once I’d got the basic idea, I kept finding more images that are close to what I envision, such as this painting by Mossmottle, Petrified Forest. So I have a really strong idea of what the design should be – but not where it’s going to come from! Once upon a time (about 20 years ago), I was pretty keen on oil painting. It’s one of those things I would love to get back to; but it’s also one of those things I’ve given up because all my free time and creative energy goes into writing. I also used to be pretty keen on photography (though was never that great. The few good shots I got were presumably more due to luck than skill). I know somewhere I have a black and white photograph I took about 15 years ago of a stream in sunlit woods. I had it framed and it was on my wall for a long time, but of course I can’t find it now. I think an image like that, suitably abstractified and colour washed may end up being the basis of the design [late edit: I eventually found that photo, and used it here]. I had chance this weekend to visit Scarthin Books in Cromford. 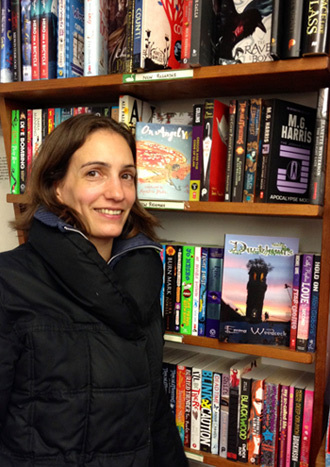 It was hugely exciting to finally see Darklands on the shelf of a proper bookshop. Of course, I blundered around the entire children’s room several times before finding it. And when I did find it I immediately percieved the problem. The spine is plain white text on a black background. Take a look at all those other book spines, with their bright colours, interesting fonts, swirls and curlicues. If Darklands stands out at all it is only through its sheer unobtrusiveness. When my designer (bf – who is btw a graphic designer, though with no previous experience of book cover design) and I were originally sorting out the cover we intended to do a wraparound cover (ie, the design goes all the way round the cover), but were slightly daunted by the technical aspects of getting all the measurements (mainly the spine width) exactly correct. There were so many other things jostling for my attention at the time that I just thought, ‘Sod it. This will be fine’. And it has been, up til now. Previously I have only sold through Amazon and in person. In both those circumstances the buyer sees the front cover of the book. The spine is irrelevant. Any revisions to the book incur a charge of £29 from FeedaRead. Looked at one way, I would need to sell 29 copies through the bookshop in order to make that a worthwhile financial decision*. But that’s not the way I see it. At this stage of what I choose to call my writing career (voluntary work might be nearer the mark), it’s all about getting it out there, getting my name known, getting people to read the damn book! Consequently, I think this would be a worthwhile investment. It isn’t just about making the book stand out. It’s about delivering a better product. I will also take the opportunity to put the ace review quote on the front cover, rather than the back. I might put a mugshot and some personal blurb on the back. And I think I’ll put some message about it also being available as an eBook. Cover design, like everything else about self publishing, is a learning curve. * I am (and have been for a month or so) intending to do a piece on total costs and returns in my first year of self publishing. Keep an eye out for that if you’re interested in the financial realities of self publishing. And now I’ve finally written that post! Further to last week’s moorland misadventure, I have to admit that the incident is still preying on my mind. Each night as I go to bed my thoughts are filled with deep mud pools and fruitless flailing. As my mind replays the incident the bog is always deeper and more sucking, solid ground further away. The helplessness and lack of mobility recall those common childhood nightmares of trying to run through air that feels as thick and unyielding as treacle*. I have tried to persuade myself that I was really not in as much danger as I thought. I have researched the subject a little. I even found a video of Bear Grylls purposefully wading into quicksand in order to demonstrate how to escape it. He made it look easy, of course. I struggled to visualise accomplishing the same manoeuvre in my situation last weekend – even if I had known or dared to lie horizontally on the surface. When I mentioned the incident to a guy in my pilates class he said that he’d had a similar experience – sinking up to his chest in a bog (in the same location). A friend had to haul him out by his rucksack. None of this reassures me. But last night a new thing occured to me. If help had immediately come, if strangers had turned up and pulled me out of the mud, I am sure I would feel twice as troubled as I do. Although the memory of helplessness is what frightens me, I was not helpless. I did rescue myself. If someone had immediately pulled me out I wouldn’t know whether I had the power to do it myself. I wouldn’t know if I could keep calm and behave sensibly. The What ifs would be all the more powerful and insistent. This has led me to wonder about the psychology of the rescued. It is of course a common trope in all kinds of fiction that a (young and beautiful) lady is in some terrible danger, but is rescued in the nick of time by a sword-wielding, wise-cracking, solid-jawed hero. I have never before really considered what the victim/heroine’s feelings on that would be. Relief, of course. Gratitude, probably. But what about later? In the deepest, quietest hours of the night? Would she see again the dragon’s powerful teeth, smell its fetid breath? 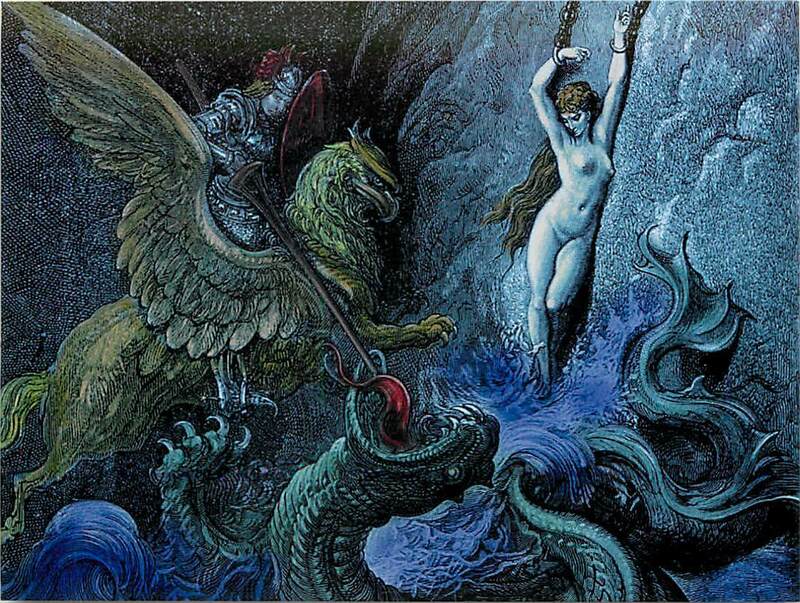 Would she struggle against the memory of those binding ropes, flinch from the licking flames? Rather than marrying the hero and living happily ever after, I now wonder if she would go mad with post-traumatic anxiety? If she would become clingy and neurotic, never allowing her rescuing hero to leave her side for fear of some further calamity befalling her – a calamity she had no power to escape herself. Or, at least, no power that she knew of. Surprisingly few fictional characters ever do suffer post-traumatic stress – despite the heroic amounts of trauma we subject them to. If they do, we quickly become impatient with their self-indulgent whining and moping. As authors we want to retain the flavour of realism, while filtering out the tiresomeness. After all, our primary objective is to be entertaining; to tell a good story. With hindsight, it seems I have something to be grateful for. I may have felt alone and forsaken as I stood dripping mud on the edge of that bog. But I have come to the conclusion that self-rescuing is far more satisfying and reassuring than being rescued. I just hope I don’t need to do it again any time soon. * That wasn’t just me, right? Yesterday, while hiking alone in a remote area of the Peak District I found myself in a potentially life threatening situation. As authors we often put our characters into dangerous or frightening situations. We try to imagine how it would feel, and how they would react. But unless your life is a lot more exciting than mine, it’s very rare that you actually find yourself in such a position. I’m coming to realise that on the rare occasions I do find myself in a pickle, it seldom feels the way I might expect. This seems a valuable lesson to learn, so I’m going to explore it a bit. If you’re reading this in the UK you will know that we’ve just had possibly the most glorious week of the entire wretched 2012 summer. Taking full advantage of this, I drove 90 minutes into the Peak District, put on my boots and set off up the moors. I often hike alone. I enjoy both the peace of solitude, and the freedom of making snap decisions to go out without having to mobilise a group. The only times I feel vulnerable when alone in the wilderness are in thick woodland, or if dusk is falling and I’m not where I’d intended to be. 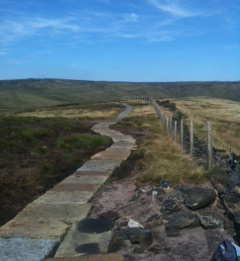 I had been intending to follow the beginning of the Pennine Way along to Kinder Downfall. But since it was so hot, and had been all week I decided to take a chance on a notoriously boggy section of moor in the other direction, towards Mam Tor. The area of moor between Kinder Scout and Mam Tor is so godforsaken it doesn’t seem to have a name of its own. It encompasses Brown Knoll, Horsehill Tor and Colbourne. The rough paths take regular detours around areas of sinking black bog. I’d been across there once before in summer when it was fairly firm underfoot; once when it was miserably boggy, requiring a painstakingly slow and circuitous route, with much jumping from tussock to tussock; and once in midwinter, when it was easy, because the ground was frozen. Unsurprisingly, the boggy areas tend to take the pattern of water courses. So you will find a boggy depression about a metre wide, running down to join another boggy depression. The ground on the other side might be grassy and solid. It might be muddy. If it’s too wide to jump, and too deep to wade, you will regularly find yourself doing long detours to get around each boggy rill (this can also contribute to getting lost, as it is hard to hold a straight line while taking constant detours). Why bother with such a miserable area at all, you ask? Well, there are really nice places either side of it, that’s why. I enjoy the thigh-tremblingly exhausting march up Jacob’s Ladder. I also enjoy the ridge over Mam Tor, Back Tor and Lose Hill, with its beautiful panoramas. Also, being such a beautiful day, the Pennine Way was predictably crowded. This path – for reasons which should be obvious – was not. I thought it’d be nice to avoid the crowds for a bit. I met a couple of old guys coming across to the Kinder Plateau from the direction I was heading in. I asked them what it was like underfoot. ‘Not bad,’ they told me. They showed me how clean their boots were. Okay, I thought, I’ll do it. They were right. The ground was mostly firm. But peat bogs can be very deceptive. The path was strewn with the usual flat expanses of black mud (being more liquid than solid, the mud always resumes a flat surface sooner or later). It is pocked with foot prints, and from the depth of these you can gauge how deep the bog goes – sort of. Sometimes the boot prints stay in place for a long time. Sometimes the bog gets soggier than it was when that last print was made – you sink deeper than whoever left that print. How deep can the bogs go? Who knows. 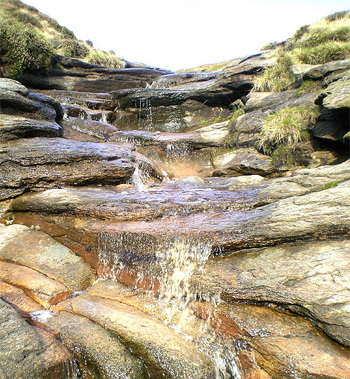 On Kinder Scout the rills can be 10 feet deep or more – but they are generally much more solid. I’m 5’8”, just so you know. So yesterday was hot and sunny; it had been all week. The boot prints were all baked in to fairly solid mud. The going was easy. I got complacent. Which is how I strode straight into a deep, wet bog, sank, and stuck. If you’ve ever sunk deeper than your boots into thick mud, you know how hard it is to pull yourself out. Bogs of course are this concept writ large. They are like quick sand. The more you struggle, the deeper you sink. My left leg sank up to the knee, my right, over the boot. I found myself sitting on the surface of the bog, gradually sinking. I tried to pull my left leg out. Nothing happened. If I was writing this scene in fiction, and trying to imagine myself in the situation, I expect there would be a lot of internal monologue; a lot of self goading, split-second contemplations of all the ways this could play out, and what the consequences would be. There might be tears, either during or after the event. I’ll tell you how it actually was. I knew right away I was in bad trouble. But I don’t recall actually thinking a single thing. I don’t mean I was in a blind, stupid panic. I just mean, I acted instinctively. I saw no options about my actions, and absolutely nothing else was important. So there was nothing to think about. I did two things: I screamed for help as loud as I could, and I began to dig at the sucking mud around my trapped leg. I had seen a group of walkers off to my right only a minute or two earlier. I could no longer see them, but I hoped they might be within shouting distance. I knew that they might very quickly walk out of shouting distance, and so I didn’t wait before screaming. Pride did not come into it. So I sat there, frantically scraping peat bog away from my leg. Of course, the mud kept oozing back into place, and all the time I could feel my other leg sinking deeper. While I dug, I yelled, ‘HELP!’ three times, pausing a little between each shout. Finally I managed to dig my leg free enough to pull up, but I was still floundering in wet mud, sinking and splashing as I tried to manoeuvre my way back to solid ground. Slowly, inching my way, I made it to the grassy tussock I’d so recently stepped from, and crawled out. I was caked in black mud, from my boots to my waist, and all up my arms. Only then did I begin to tremble and mutter profanities. Absolutely purposeful while in danger, as soon as I was safe I didn’t know what to do. I didn’t want to touch any of the things in my rucksack. The only dry place to wipe my hands was my vest. While I stood there, the group of walkers I’d seen earlier ambled past about 50 yards away without giving me a second glance. A couple came down the path, the same way I had. I waited til they drew close, then asked if they had any wet wipes. Thankfully they did, and I was able to at least clean my hands. I stood talking to them for about ten minutes. It turned out they were lost, and had a rubbish map. I showed them where they were; it wasn’t where they wanted to be. I told them to retrace their steps, and which direction to take when they reached the top of Jacob’s Ladder. Before they left, the guy said, ‘I think you helped us more than we helped you!’ He was wrong. I needed that human interaction just then; that breathing space of normality. I needed to talk about what had just happened. And I needed to know that there were other people on that path. That if I hadn’t been able to dig my leg free, someone would have come along. Someone would have found me – before it was too late. I considered heading back with them, and returning to my car. But instead I carried on. By the time I reached the edge of the bog I was mostly dry – filthy, but dry. I walked a further six miles or so, my black-streaked legs attracting a few curious glances as I passed. I even enjoyed myself once I’d left the bog behind and strode up on to Mam Tor. I didn’t feel particularly thankful to be alive. I felt a sick, squiggly feeling in my stomach at the thought of drowning in porridgey mud. I still do. I will continue to hike alone, but I have no desire to ever visit that particular stretch of moor again. * Unfortunately my iphone (with which I was taking photos) was in my back pocket at the time, and didn’t thrive on the experience. It’s spent the remainder of the weekend dissassembled in a bag of rice, and seems to have dried out sufficiently to recover – phew! I only have a handful of photos from that day though – I couldn’t take any after the dunking. I’m very pleased to announce that from now on I will be a regular contributor to the Brit Writers blog. This is a new site, full of great posts by authors about everything to do with the writing process. Rest assured, I’ll still be posting here too, but some of my posts will be shared on both sites. I decided I wanted to write books when I was 13. I kept thinking I should probably aim at a proper career, and made forays into art and pottery (that was my teenage idea of a proper career – ha! ), libraries and then computing – but really all I wanted to do was write books. I reached my mid 30s, life hadn’t turned out the way I’d imagined it would, and I thought, Why don’t I just do it? What have I got to lose? I found myself the only part time web design job in the country, reconciled myself to living on twigs and acorns for a year or so, and sat down to write. That was almost five years ago. I had no idea quite how large an undertaking it would be. I said I’d give it a year. That’s how long I’d calculated my meagre savings could supplement part time wages. But right then the global economy went kerblooey, and my cost of living shot up. I had to readjust those sums. But I kept going, and after two years I had what I called the first draft (it was actually the fourth or fifth) ready to nervously hand out to my beta readers. They were overwhelmingly positive, but the few criticisms and suggestions they had really helped me hone the manuscript into the best it could be. I spent another year on editing until I was absolutely satisfied with it. I then spent a year collecting rejection letters from agents and publishers – a couple of personal, encouraging ones, but mostly printed slips. I decided to look into this ebook self publishing marlarkey. I was dubious. I was wary. But in the end I thought, I’ve spent four years on this book, I might as well see if anyone wants to read it. I published Darklands as an eBook exactly a year ago, and followed that up with a paperback earlier this year. I’ve spent the past year amateurishly dabbling in the dark arts of marketing (while also trying to write my new novel). This is possibly the hardest and most soul crushing part of the whole process. The book is finished. It’s available. It’s got good reviews. “Build it, and they will come,” right? Wrong. Approximately 173,609** other writers of young adult fantasy are also attempting to promote their excellent five star novels. How do you make your book stand out from the crowd? That’s the million dollar question. I’m still trying to figure it out. If I hit on any great strategies I’ll keep you informed. 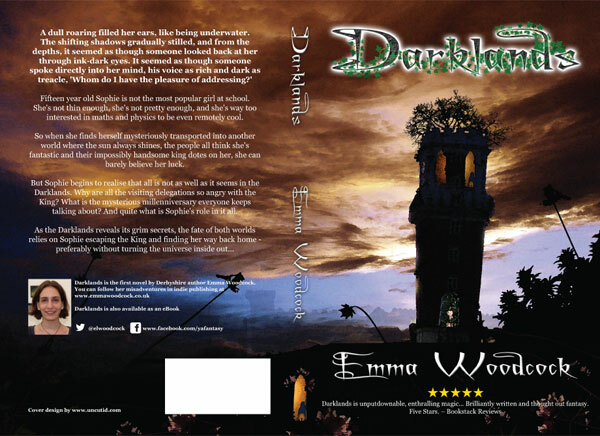 Emma Woodcock is the author of Darklands, a young adult fantasy novel concerning parallel worlds, changelings, golems, a handsome but diabolical King, a shy and geeky protagonist, and some foul tempered unicorns. * Apparently some people can write books in the evenings and at weekends. I don’t know how they do that. I could make myself sit at my computer when I got home from work at 7pm, but my brain would be mush, and all that would dribble out of it would be nonsense. Also, my partner might start to forget what I look like. ** source: I made it up.